It should be interesting to know that the first Closed Circuit TeleVision camera was installed in the year 1942 in Germany to observe the launch of V2 rockets. CCTV recording systems used at launch sites of rockets help to find the possible cause of malfunctions. Sometimes large rockets come fitted with CCTVs to enable pictures are transmitted back to earth by radio links. Traditionally a closed circuit implies that a video camera is hooked to a monitor – video Door phones, simple security camera system fall into this bracket. These days even wireless Video cameras can be included into this category. Earlier X10 devices which used wireless communication in the frequency range of 2.4 GHz also fall into this group. Wireless CCTV cameras are easy to set up and install. They require just a basic mains outlet to supply the camera power requirements. The video output is sent through an encoded RF signal to a remote receiver which in turn provides the CVBS output ( composite Video with Blanking signal – technical word to describe a common composite video out ) to a TV or a monitor. If you have other electronic devices operating in this frequency spectrum like a microwave or a 2.4 GHz cordless, you may have to relocate your camera / receiver position. At the least reposition the ear like antenna provided with these devices. Some automobiles also emit spurious wide band radiation falling under this spectrum. So if you face poor reception with your Wireless CCTV camera system, and you live close to a main street, you may have to increase the signal level. Technical people will talk in terms of signal to noise ratio. By carefully aligning the transmitter and receiver antennas – facing each other, you may improve the conditions. Metal structures and concrete walls can also attenuate the signal at this frequency. We will cover the latest Networked cameras – IP cameras – the type which takes away the problem of installing video and power cables by using Wifi or the inexpensive Internet cabling in a different page. Briefly, Wifi Cameras or IP (Internet Protocol) Cameras use built-in networking circuits to enable better connectivity without drawing up signal cables. But they do need power supply cables. If you are setting up IP cameras for peripheral security, make sure that their power supply lines are hidden or at least they are routed through metal conduits so that they are not cut by vandals or a determined thief. Traditionally CCTVs were used in banks, casinos and airports to provide the first level of perimeter security. Today they are widely used in streets, public places and in many homes as they come inexpensively priced and widely accepted. After September 11, public acceptance of better security through intrusive cameras is on the rise. CCTVs are effective part of the home security system and immensely help in everyday surveillance. Surveillance camera Resolution: One of the most important criteria for the selection of these cameras is their resolution. A typical camera should have at least 2 megapixel resolution to detect a face or a number plate reliably. HD resolution at the lower end is 1920 x 1080. Another critical need is adequate lighting. For Night Vision, many cameras use infra red LEDs around the face of the camera. These kind of camera housings should not have any glass on their face as it will reflect its own generated Infrared. For best results, aim for at least 300 - 500 lux of light illumination at the target area. In the early days, electronic cameras used vidicon devices to convert the light information into electronic pulses so that they can be rendered in a monitor located elsewhere. The pickup devices were bulky and expensive. They had other problems too – were prone to halo – a kind of smearing when tracking brightly lit objects and also could go 'blind' when subjected to bright static objects in their field of vision for a prolonged period. Modern pick up devices are CMOS (Complementary Metal Oxide Semiconductor) or CCD (Charge Coupled Device) which are inexpensive to manufacture and relatively free from the defects of the bulky devices. Current consumption also dropped to more realistic level allowing you to operate a camera with barely a few tens of milliampere current requirements. As a result the cost of a CCTV installation has nose dived to a unheard of level. 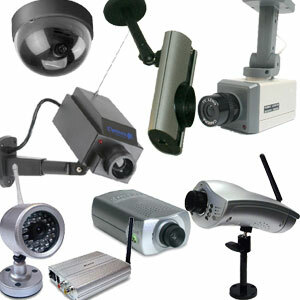 You can set up a basic stand alone security camera installation for just about 100 dollars – batteries included. In such CCTVs, the video cameras are used to transmit a signal to a specific and limited set of monitors. The video is connected directly to the recording or viewing source without being broadcast and this makes the system more effective. Unlike ‘broadcast television’ in CCTV the signal is not openly transmitted. Hence in retail store chains and shopping malls they are used to detect, discourage and prevent crimes. In industrial plants, CCTVs are used for observing the processes that are remote from the central control room. CCTV systems can also be used for monitoring for safety. For instance in a subway train, the CCTV camera allows the operator to confirm that people are clear of doors before closing them and starting the train. In amusement parks, a CCTV system enables the operators to observe that no one is endangered by starting the ride. While reversing a vehicle, the CCTV camera fitted to the dashboard helps the driver to observe objects which may not be otherwise visible. CCTV equipment may either be used continuously or specifically for certain limited periods of time so as to monitor a particular event. Those who oppose CCTV attribute the loss of privacy of the people under surveillance. They feel that it impinges on the civil liberties of individuals and surveillance would have a negative impact. There are those who argue that CCTV does not reduce crime but simply displaces it. The growth of CCTV in housing areas raises serious issues about the extent to which CCTV is being used as a social control measure rather than to simply deter crime. The illegal access to CCTV recordings is also severely questioned which sometimes happens outside the government permission for the use (or abuse) of CCTV. CCTV cameras are vulnerable against a number of tactics. There are instances when cameras are deliberately destroyed. The images in the camera lens can become blurry by spraying certain substances over it. High powered lasers can damage the cameras permanently. In wireless networks, when another broadcasting signal of the same frequency is sent, the network can become jammed. Unless the camera has bullet resistant housing, it can be shot at. Sometimes the CCTV recording device can be physically broken unless the recorder is shrewd enough to hide the recording device in a less obvious place. First Published Date: 23 Oct 2006 Last modified Date: April 18 2019 This page may have been updated recently as new information is available or the content may have been edited for better readability.